Excitedly, I quickly snapped a dozen shots before it flew away. As it flew off, I walked away happily, contented that I had captured so many shots. 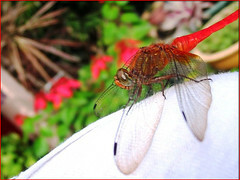 Then, a few seconds later, to my profound surprise, this stunning red dragonfly detoured and settled on my left shoulder. I grasped unbelievingly with delight and automatically brought my camera towards it with my right hand, hoping to capture the magical event! But of course my left hand remained ‘frozen’ to prevent any reflex movement on the left shoulder that could trigger its flight. And to my utter astonishment, all 4 shots taken came out great in spite of the angle of take and inability to see the camera’s focus! Wow! What a marvelous and exciting experience! What a joyous blessing! Here are my first captures of it in August, 2007. On the left is an image of a female Orthetrum testaceum with greenish brown thorax, followed by a golden brown abdomen with obscure dark markings. Not as striking as the red male, but pretty all the same! 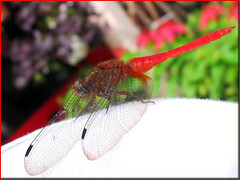 So wonderful to be able to capture this female dragonfly, found unexpectedly flying wildly in our garden in mid-February, 2008 and to post it here so that you can observe the difference. Unlike we humans, the female dragonflies are less glamorous, don’t you agree? 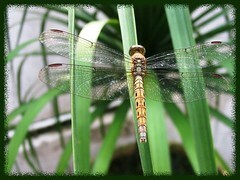 ;) View Asia Dragonfly site to see the changes of coloration between an aging and a young female of this beautiful Orthetrum species. 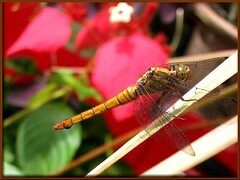 Habitat: Open areas around rivers, lakes, ponds, marshes. 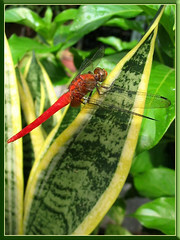 How lovely to have found this attractive dragonfly resting on the Ponytail Plant in our garden about a month ago. An adolescent female Orthetrum testaceum I assumed, judging from its smallness (about 1.7 ins long) and well-defined markings on its body.